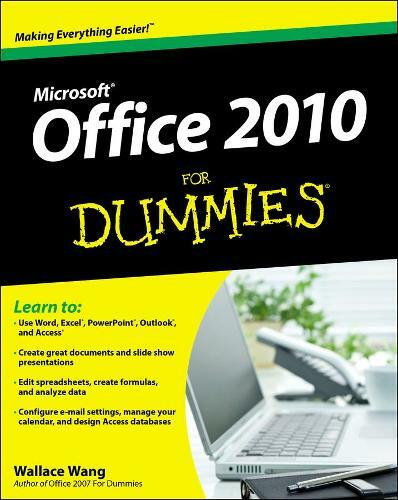 The latest edition of one of the bestselling Microsoft Office books of all time!Spend less time figuring out Word, Excel, PowerPoint, Outlook, and Access and more time working on actual projects with this new edition of Office 2010 For Dummies. Filled with straightforward, friendly instruction, this book gets you thoroughly up to speed, and it actually makes doing Office work fun!First learn all the basics, then how to add more bells and whistles, including how to spice up your Word documents, edit Excel spreadsheets and create formulas, add sound to your PowerPoint presentation, and much more. * Helps you harness the power of Microsoft Office 2010 and all of its new functionality; the book covers Word, Excel, PowerPoint, Outlook, and Access * Explains and instructs in the straightforward, friendly, For Dummies style that makes instruction more accessible and skill-building easier * Covers typing and formatting text in Word and spicing up your documents * Shows you how to navigate and edit an Excel spreadsheet, create formulas, and chart and analyze Excel data * Demonstrates how to create a PowerPoint presentation and add color, sound, and pictures * Explores Outlook, including configuring e-mail, storing contacts, organizing tasks, scheduling your time, and setting appointments * Delves into designing Access databases, including editing, modifying, searching, sorting, and querying; also covers viewing and printing reports, and moreBe ready to take full advantage of Microsoft Office 2010 with this fun and easy guide.